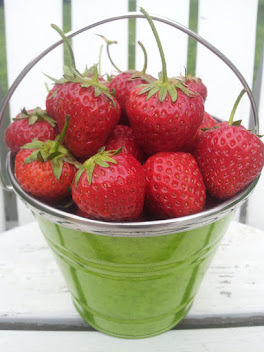 It’s that time of year again ~ 14 pounds of juicy fresh STRAWBERRIES have been picked, cleaned, and puréed (my hands might stay berry-stained-pink for a while). Oh, how I wish you could smell the sweet scent throughout the studio! 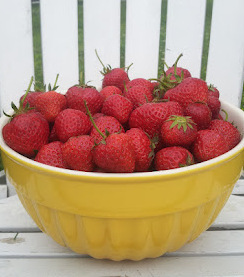 (Imagine the freshest strawberry jam, you have ever enjoyed smelling… mmmm mmmm mmmm). for incredibly soft and supple skin. Use in the bath, shower, or as a hand and foot scrub in a mani/pedi treatment. Tip: When you regularly exfoliate your skin with a natural scrub or polish, it becomes healthier in performance and appearance. Once dead skin cells have been exfoliated, your body’s largest detoxification organ (skin) can work much more efficiently to flush out toxins and take in nourishment. Skin becomes more even in appearance, is smoother to touch, and possesses a fresh, healthy glow. Virgin crème de coco – It is extracted from fresh coconut milk, the most superior grade of coconut oil available. 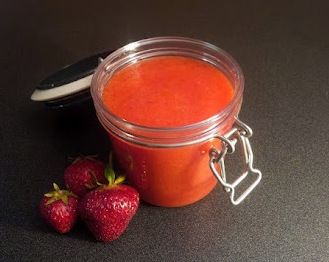 · Excellent source for beta-carotene, Vitamin A. Can help reduce your risk of developing premature signs of ageing. This sweet treat for your skin and senses is only available for a limited time ... while supplies last.